Few things are more annoying for a home cook than having to stop and run to the grocery store mid-recipe for more ingredients. 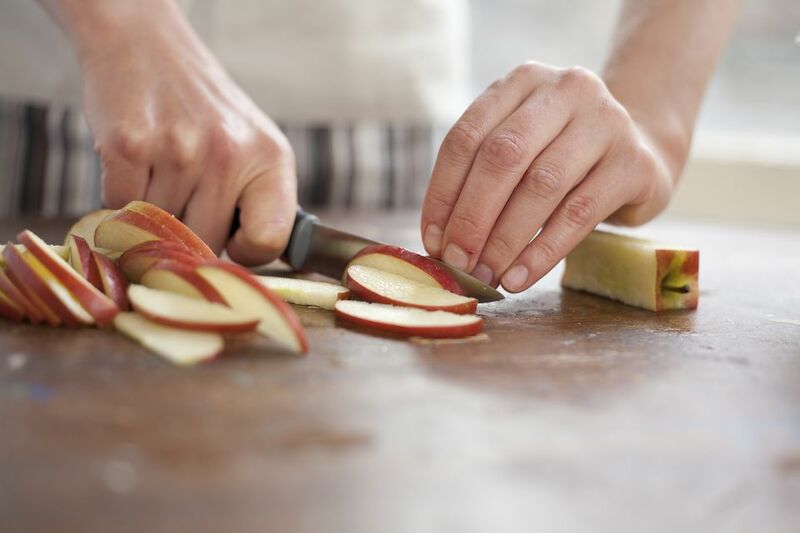 Let's say you have a new recipe that calls for 10 cups of sliced apples. To avoid a mid-prep shopping trip, how many apples do you need to buy? It's difficult to say because every apple is a little different from the next. Here is a list of equivalents that might help you when you are standing in the produce section at your favorite market. A bushel of apples is the dry equivalent of 2 gallons of produce. According to this equivalent list, 10 cups of sliced apples requires 10 medium apples. To be on the safe side, buy one additional apple. You don't want to run short—after all, it's always better to have too many ingredients than too few! Small apples are approximately 2 1/4 inches in diameter. Medium apples are approximately 2 3/4 inches in diameter. Large apples are approximately 3 3/4 inches in diameter. To keep things interesting, when apples are sliced thinly, more slices fit in a measuring cup than when they are sliced into thick chunks. Some apples are tart and some are sweet. Some are relatively hard and some are almost mealy. These types of challenges are why cooking is often referred to as an art. If your recipe calls for a specific type of apple—Granny Smith, for example—buy that apple type. If it isn't available, buy a similar hard or crisp apple to substitute for the Granny Smith apples. If you don't know which apples are similar to the type called for in your recipe, ask the produce manager for help. Pears and peaches can be substituted for apples in some cooked recipes. Compotes, poached fruit, pancakes, and fruit pies can use pears, peaches, and apples interchangeably. Papayas provide nutrition that is similar to that found in apples. A papaya has more fiber than an apple and tastes delicious when tossed in a salad with cucumber, jicama, lime juice, chili powder, and salt. Quinces can be used in cooked recipes as an apple substitute. However, they are denser than apples and not as sweet so recipes might need to be adjusted. One way to approach this is by first poaching the quinces in water with honey, sugar, lemon juice, and a vanilla bean. Fresh pineapple run through a food processor can replace applesauce in a recipe. So can pureed apricots, prunes, or bananas. Raspberries and blueberries are apple substitutes in baked muffins and coffee cakes.